Stamps Postings: A ride in the park! Well it rained all stinking weekend! 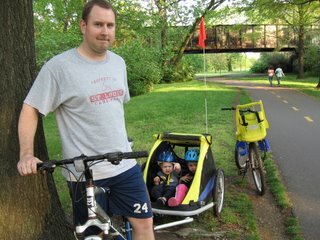 So we didn't get to go outside basically all weekend until all of a sudden the rain stopped so we loaded the bikes up and headed to ride along the Potomac River. Don't the kids look so cute and cozy in their little buggy??? Well it ended up not being a cozy little ride for me! As you can see my bike is sitting next to them and that's about all it was good for! My bike just locked up about 1/2 mile down the trail. So I had to start walking my bike back to the car and I was bumped I wasn't gonna get to ride with them. Well the walk back was horrible......and pulling the bike was like pulling a huge dead cow and it was a major workout. I couldn't believe how tired I was when I finally got back to the car! So hopefully my bike will get fixed soon and I'll be back in business!